A flotilla of more than a hundred trawlers in the Bay of Seine in November of last year. French and British fishing crews skirmished in the English Channel on Tuesday, throwing stones and ramming each other's boats — the latest in a long-running row over scallop catches. 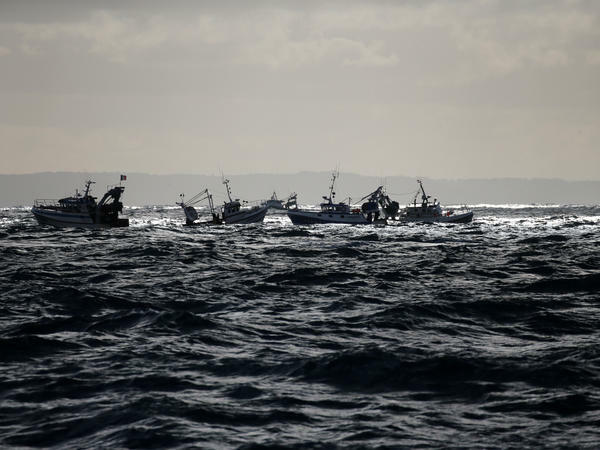 The clashes occurred about 12 nautical miles off the coast of Normandy, near the Bay of Seine, where French crews are restricted by their nation's laws to fishing for scallops from Oct. 1 through May 15. However, boats from the U.K. are free to take the lucrative shellfish from the seabed year-round, although according to The Telegraph "in previous years a gentleman's agreement has generally allowed both sides to harvest scallops fairly." The on-again, off-again conflict has been dubbed the "Scallop Wars." In Tuesday's confrontations, the French fishermen heavily outnumbered their English rivals, five boats to 35, Agence France-Presse reported. "The French went to contact the British to stop them working and they clashed with each other. Apparently there was stone-throwing, but no injuries," Dimitri Rogoff, the president of the regional Normandy fishing committee said, according to AFP. French fishermen accuse the British of depleting scallop stocks in what they consider their home waters. The French boats gathered overnight Monday, ready to confront the English, who they accuse of "pillaging." "The French went out to meet the British to stop them working," Rogoff was quoted in The Telegraph as saying. "They clashed. Stones were thrown. The French almost completely surrounded the British." Footage from France 3 Normandie showed boats ramming each other, and some were damaged in the melee. "We are advising all parties to be calm as from the video clips some vessels are manoeuvring very dangerously," Barrie Deas, chief executive of Britain's National Federation of Fishermen's Organisations, told AFP. The BBC says that ultimately, "[the] British couldn't match the local armada for numbers ... [and were] chased away." According to The Times of London, British fishermen have called on the Royal Navy for protection from the French boats. The Times notes, "There have been Franco-British tensions over scallop fishing for years but feelings are running high this summer because of a breakdown in talks that the French blame on Brexit." AFP reports, "The two sides have reached annual agreements over the past five years, but according to Rogoff the French blocked a deal this year, saying they had had enough. 'For the Brits, it's an open bar – they fish when they want, where they want, and as much as they want,' he complained." However, the pro-Brexit organization Fishing for Leave, has accused French fishermen of hypocrisy, claiming they have caught 60 percent of the fish in British waters in the past four decades.